We, the inheritors, know that the Mughal emperors loved gardens, that the empire under them stabilized and grew to an unprecedented extent, that the culture of their time was dictated by Persian mores. 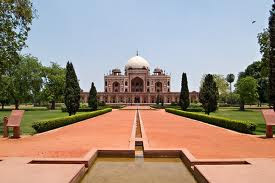 All features are visible in the second Mughal Emperor Humayun's tomb,though the story of the Mughal love for gardens begins with the first emperor, Babur. He pined for the flowers and water channels of his beloved Kabulian what he called a Hindustan of 'no ice or cold water.... excessive earth and dust flowing about...'.His son Humayun, and daughter-in-law Hali Begum had spent five years in exile in Persia, surrounded by the Central Asian concept of gardens, a geometrically planned landscape with water, all-important in the desert, being given pride of place. 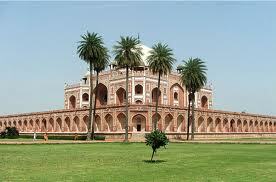 Humayun returned from Persia with many poets, and his Begum with a retinue of Persian architects and artisans. Thus began the formal interface of Persian trends with Indian architecture, the apogee of which is found in the Taj Mahal, Agra. 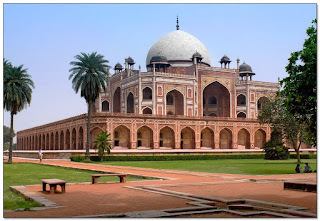 The complex encompasses the main tomb of the Emperor Humayun, which houses the graves of his wife, Hamida Begum, and also Dara Shikoh, son of the later Emperor Shah Jahan, as well as numerous other subsequent Mughals, including Emperor Jahandar Shah, Farrukhsiyar, Rafi Ul-Darjat, Rafi Ud-Daulat and Alamgir II. It represented a leap in Mughal architecture, and together with its accomplished Charbagh garden, typical of Persian gardens, but never seen before in India, it set a precedent for subsequent Mughal architecture. 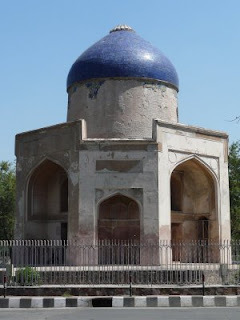 It is seen as a clear departure from the fairly modest mausoleum of his father, the first Mughal Emperor, Babur, called Bagh-e Babur (Gardens of Babur) in Kabul (Afghanistan). Though the latter was the first Emperor to start the tradition of being buried in a paradise garden. Modelled on Gur-e Amir, the tomb of his ancestor and Asia's conqueror Timur in Samarkand, it created a precedent for future Mughal architecture of royal mausolea, which reached its zenith with the Taj Mahal, at Agra. The building style is a combination of Persian architecture and indigenous building styles. The right combination of the red sandstone building medium with the white marble, the latter used as large inlays, exhibits the maturity of this style. This kind of combination of red sandstone and white marble in the tombs could be invariably seen in the architecture of Delhi Sultanates of 14th century A.D. 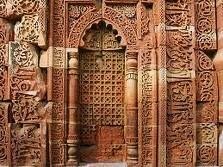 The earliest example, of course, is the Alai Darwaza which has exquisite white marble decorations over red sandstone background. The Mughals readopted this style of decorative architecture and in a sense revived this technique of construction. The symmetrical and simple designed on the exterior is in sharp contrast with the complex interior floor plan, of inner chambers, which is a square 'ninefold plan', where eight two-storyed vaulted chambers radiate from the central, double-height domed chamber. It can be entered through an imposing entrance iwan (high arc) on the south, which is slightly recessed, while others sides are covered with intricatejaalis, stone lattice work. 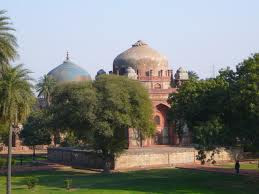 Underneath this white dome in a domed chamber (hujra), lies the central octagonal sepulcher, the burial chamber containing a single cenotaph, that of the second Mughal Emperor, Humayun aligned on the north-south axis, as per Islamic tradition, where in the head is placed to the north, while the face is turned sideways towards Mecca. The real burial chamber of the Emperor, however lies further away in an underground chamber, exactly beneath the upper cenotaph, accessible through a separate passage outside the main structure, which remains mostly closed to visiting public. This burial technique along with pietra dura, a marble and even stone inlay ornamentation in numerous geometrical and arabesque patterns, seen all around the facade is an important legacy of the Indo-Islamic architecture, and flourished in many later mausolea of the Mughal Empire, like the Taj Mahal, where again we find twin cenotaphs and exquisite 'pietra dura' craftsmanship. 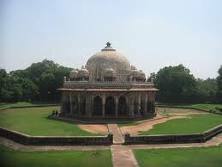 the main tomb took over eight years to build, it was also placed in centre of a 30-acre (120,000 m2) Char Bagh Garden (Four Gardens), a Persian-style garden with quadrilateral layout and was the first of its kind in the South Asia region in such a scale. The highly geometrical and enclosed Paradise garden is divided into four squares by paved walkways (khiyabans) and two bisecting central water channels, reflecting the four rivers that flow in jannat, the Islamicconcept of paradise. Each of the four square is further divided into smaller squares with pathways, creating into 36 squares in all, a design typical of later Mughal gardens. The central water channels appear to be disappearing beneath the tomb structure and reappearing on the other side in a straight line, suggesting the Quranic verse, which talks of rivers flowing beneath the 'Garden of Paradise'. The tomb is located at the southeast corner in the garden complex. The tomb is datable to 1590-91, through an inscription found inside. The person interned in this tomb is unknown, the local name of the tomb is Barber’s Tomb (Nai ka Gumbad). The monument is located outside the eastern enclosure wall, which is locally known as Nila Gumbad, due to the blue coloured dome. 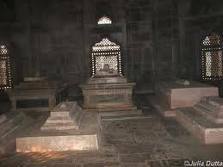 It is believed to contain the remains of one Fahim Khan, the attendant of Abdur Rahim Khan, who lived during the reign of Jahangir. The attendant died in 1626 A.D. The building is located outside to the northeast corner of the mausoleum and in Tughluq style. The building is believed to be the residence of Shaik Nizamuddin Aulia who died in 1325 A.D. 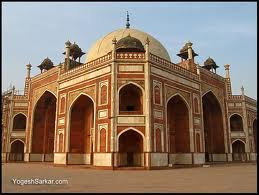 The mosque is located to the southwest of the west gate of the main mausoleum, the building is dated between 1560 and 1567 based on the architectural style. The tomb is located adjacent to the Afsarwala Mosque, and is an unidentified tomb. 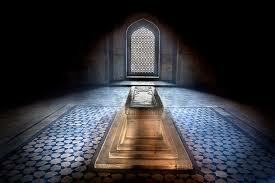 One of the marble graves inside the tomb has a date of 1566-67 A.D.. 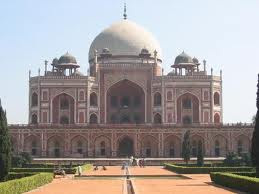 The sarai was built by Haji Begum, the widow of Humayun in 1560-61 to house the three hundred Arab priests, who were said to have been brought with her from her pilgrimage to Mecca. 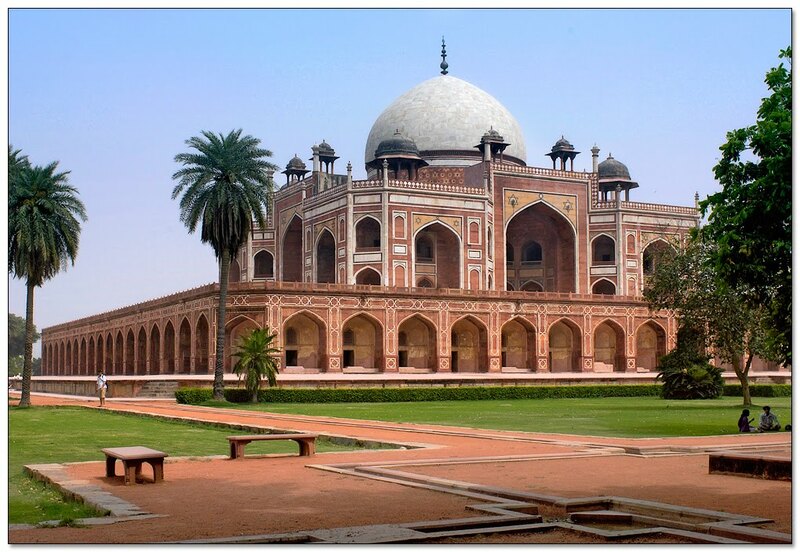 Another version is that the building housed the Persian workers and craftsmen who were actually engaged in building the Humayun’s Tomb. 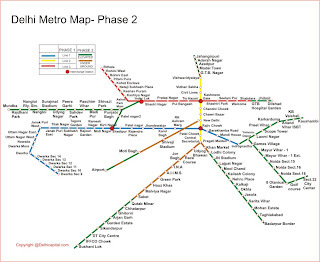 The sarai is located adjacent to the Afsarwala mosque. The visitor entering the Humayun Tomb complex first enters into a garden complex, known as the Bu Halima garden. However, the origin of the name is not known and the garden on its style could be datable to the early Mughals. The tomb and mosque of Isa Khan is located to the south of the Bu Halima garden. An inscription on a red sandstone slab indicated that the tomb is of Masnad Ali Isa Khan, son of Niyaz Aghwan, the Chief chamberlain, and was built during the reign of Islam Shah, son of Sher Shah.